Distressing 100% cotton jeans gives you a much more shreddy/stringy look (like this one by Free People). If you’re working with skinny jeans though, they likely have elastane or spandex for some stretch, so they distress differently – a little more “chewed” and hole-y looking (the ones I am using for today’s demo are 74% cotton, 24% polyamide, 2% elastane). Also, if you’re buying a brand new pair of jeans for this, be sure that you have enough room to fit in them after they shrink a bit in the dryer (necessary for the distressing process). Just a few tips/disclaimers before we take a razor blade to them! Ok, now that you know all of that, let’s begin! 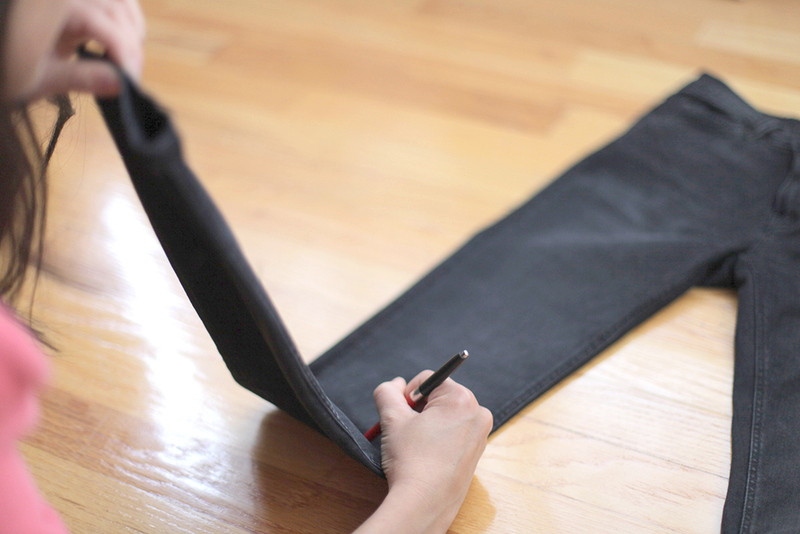 Find the knee of your jeans by folding the bottom hem up to the point. Mark that crease with your pen/pencil so you know where you will want to begin your cuts. You’ll want to double up your cardboard and put it into the leg of your jeans to use as a backing when you begin making the cuts. The last thing you want to do is cut through both sides of your jeans! Press firmly and begin making your cuts. Space them out between 1/8″ and 1/4″. Giving a little variation mixes it up nicely and keeps it from looking too uniform. This is the pattern I cut on the left leg. The right leg I kept more contained to the knee area. Distressed jeans are definitely one thing that you don’t want to be perfect and symmetrical. Next I added a few little nicks to the coin pocket and pocket hemline. You can also add some distressing on the back pockets for that naturally worn look. Just be careful not to cut into the stitching. You’ll want to throw them into the washer and dryer for one cycle (or two)… and you’re done! They should emerge a totally unique pair of distressed skinny jeans! You did a very good job with these jeans, love them!